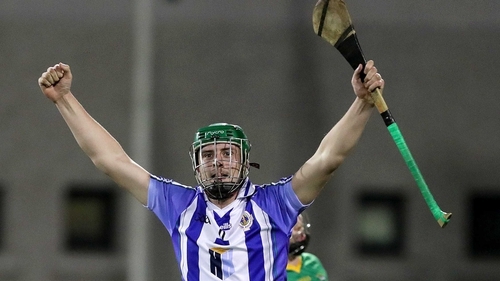 On a remarkable and emotional evening at Parnell Park, Dubliners Ballyboden St Enda's eventually edged an epic affair to secure an AIB Leinster club SHC semi-final spot. Paul Ryan's 0-15 haul in a game that stretched to almost 85 minutes ultimately proved decisive while substitute Paul Doherty hit a timely 1-02 in extra-time. Yet progression to face Coolderry on Sunday week seemed irrelevant in the broader scheme of things as the Clonkill club grieved the tragic death of Annabel Loughlin, the daughter of club man and former Westmeath player Enda Loughlin, whose funeral took place today. Just hours later, the Clonkill players took to the field in north Dublin and turned in a terrific display of guts and determination to force extra-time but they eventually ran out of steam. Clonkill started strongly in normal time, opening at a frantic pace to run up a 0-06 to 0-02 lead in the first quarter and clearly fancied pulling off an historic win. Their brand of hungry hurling overwhelmed 'Boden as Anthony Price and Eoin Price, top scorer Brendan Murtagh and Mark Keegan all made the score-sheet. Ballyboden eventually found their range to respond with five unanswered points, briefly taking the lead, before Eoin Price levelled it again with a point from way out on the wing. The back and forth continued and the sides remained level at 0-09 apiece in first-half injury-time when Niall Ryan struck for 'Boden's opening goal. Aidan Mellett created it by forcing a turnover in the Clonkill defence and Conor McCormack eventually fed Ryan who tapped in from close range. It left Ballyboden 1-09 to 0-10 ahead at half-time but this one always looked like going to the wire and they were level five times throughout the second-half in a frantic affair. Luke Loughlin's 43rd-minute goal after good work along the left endline by Niall Mitchell left it at 1-11 apiece. Ballyboden continually took the lead in the closing quarter but Clonkill simply refused to throw in the towel and hit back on each occasion. Niall McMorrow, a sub for 'Boden, thought he'd hit the winning point in injury-time but Murtagh's eighth point of the evening levelled it at 1-17 to 1-17 and forced extra-time. It was anyone's guess who'd prevail after the extra 20 minutes and Murtagh put Clonkill ahead with a point after the restart but that was as good as it got for them. Ballyboden responded with four unanswered points to take a lead that they would hold onto this time. The margin was out to six points late on in the second-half of extra-time when Niall Mitchell got a slight touch to a long range free to claw back a goal for Clonkill. But there was to be no fairytale ending for the visitors who conceded a second goal in the 82nd minute when Doherty was picked out in acres of space and calmly slotted in. Ballyboden St Enda's: Conor O'Donoghue; Dean Curran, Luke Corcoran, James Madden; Shane Durkin, Simon Lambert, David O'Connor; Stephen O'Connor (0-01), Finn McGarry; Conal Keaney (0-02), Conor Dooley, Niall Ryan (1-01); Aidan Mellett (0-02), Conor McCormack, Paul Ryan (0-15, 0-12f, 0-03 65). Subs: Colm Basquel for McCormack (44), Paul Doherty (1-02) for Dooley (52), Niall McMorrow (0-01) for McGarry (52), James Roche (0-01) for Niall Ryan (62), N Ryan for Basquel (70+1), Malachy Travers for Lambert (81), Colm O'Neill for S O'Connor (81). Clonkill: Andrew Mitchell; Darragh Egerton, John Kenny, Mikey McGrath; Alan McGrath, Paddy Dowdall, Luke Folan; Shane Power, Christopher Austin; Luke Loughlin (1-02), Mark Keegan (0-01), Alan Dowdall; Anthony Price (0-01), Eoin Price (0-4), Brendan Murtagh (0-11, 0-07f). Subs: Niall Mitchell (1-00) for L Folan (9), Jordy Smyth for Alan Dowdall (44). Alan Dowdall for Anthony Price (e/t), Jack O'Brien for Power (74), John Fagan for Mikey McGrath (75).